New Delhi: The next time you take a Metro ride, you might be able to pay for it using your Paytm wallet. A new token currently being tested by the DMRC will allow you to travel, automatically deducting the fare from your Paytm balance, instead of making you repeatedly recharge a Metro card. We reached out to Paytm to find out more, but while the company did not officially comment on the matter, a representative told us that the DMRC tie up is underway, and will be announced in the near future. We were told that the specifics of the integration, such as the accounts to be credited, were still to be worked out, and both Paytm and DMRC are in the process of working out the details. We also tried calling the DMRC Chief PR Officer seeking more details from the organisation, but there has been no response till the time of filing this report. Paytm already has a tie up with the Mumbai Metro that allows you to recharge your Mumbai Metro card online. The DMRC also has an app called Offer World, which allows you to check the balance of your Metro card, top it up online, and includes offers, that pay you DMRC credits for your card. The app allows other companies to advertise on it, by incentivising app installs – you download sponsor applications to earn money, so, for example, if you were to download the Meru Cabs app, you would get Rs. 20, while downloading MakeMyTrip would earn you Rs. 10, added to your metro card. 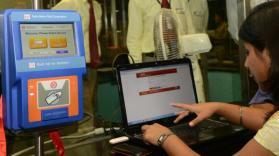 The DMRC also has a website, DMRC Smart Card, where you can recharge your Metro card online. The advantage of Paytm integration as described at the start of this article is that you would not have to maintain multiple wallets – if you already use Paytm for recharges and other services such as Uber, then you only need to keep a single wallet filled with cash to use for the Metro as well.